Unity of religion is a core teaching of the Bahá'í Faith which states that there is a fundamental unity in many of the world's religions. The principle states that the teachings of the major religions are part of a single plan directed from the same God. It is one of the core teachings of the Bahá'í Faith, alongside the unity of God, and the unity of humanity. The Bahá'í teachings state that there is but one religion which is progressively revealed by God, through prophets/messengers, to mankind as humanity matures and its capacity to understand also grows. The outward differences in the religions, the Bahá'í writings state, are due to the exigencies of the time and place the religion was revealed. The Bahá'í writings state that the essential nature of the messengers is twofold: they are at once human and divine. They are divine in that they all come from the same God and expound his teachings. In this light they are seen as one and the same. At the same time they are separate individuals (their human reality) and known by different names. Each fulfills a definite mission, and is entrusted with a particular revelation. Bahá'u'lláh, the founder of the Bahá'í Faith, claimed to be the most recent, but not the last, in a series of divine educators which include Krishna,Jesus, Buddha, Muhammad, and others. The Bahá'í teachings state that religion has been revealed progressively from the same God through different prophets/messengers, who at different times through history and in different locations come to provide the teachings of God. In this way the Bahá'í teachings see that religion has the same foundation, and that the various religions are "different stages in the eternal history and constant evolution of one religion". The Bahá'í concept of progressive revelation states that God is regular and periodic in revealing his will to mankind through messengers/prophets, which are named Manifestations of God. Each messenger in turn establishes a covenant and founds a religion. This process of revelation, according to the Bahá'í writings, is also never ceasing, The general theme of the successive and continuous religions founded by Manifestations of God is that there is an evolutionary tendency, and that each Manifestation of God brings a larger measure of revelation (or religion) to humankind than the previous one. The differences in the revelation brought by the Manifestations of God is stated to be not inherent in the characteristics of the Manifestation of God, but instead attributed to the various worldly, societal and human factors; these differences are in accordance with the "conditions" of the time the messenger came and the "spiritual capacity" of humanity. The Bahá'í teaching states that while certain aspects of religious teachings are absolute, others are relative; for example all religions would prescribe honesty and denounce theft, but each religion may have different laws related to social institutions such as divorce. These differences in the teachings of the various religions are seen in the Bahá'í teachings to be needed since human society has slowly and gradually evolved through higher stages of unification from the family to tribes and then nations. Thus religious truth is seen to be relative to its recipients and not absolute; while the messengers proclaimed eternal moral and spiritual truths that are renewed by each messenger, they also changed their message to reflect the particular spiritual and material evolution of humanity at the time of the appearance of the messenger. In the Bahá'í view, since humanity's spiritual capacity and receptivity has increased over time, the extent to which these spiritual truths are expounded changes. The Manifestation of God is a concept in the Bahá'í Faith that refers to what are commonly called prophets. The Manifestations of God are a series of personages who reflect the attributes of the divine into the human world for the progress and advancement of human morals and civilization. The Manifestations of God are the only channel for humanity to know about God, and they act as perfect mirrors reflecting the attributes of God into the physical world. Bahá'í teachings hold that the motive force in all human development is due to the coming of the Manifestations of God. In Bahá'í belief all of the Manifestations of God are from the same God and have the same spiritual and metaphysical nature, and that there is absolute equality between them. The differences between the various Manifestations of God and their teachings, Bahá'u'lláh explained, are due to the varying needs and capacities of the civilization in which they appeared, and not due to any differences in their level of importance or nature. The Manifestations of God are taught to be "one and the same", and in their relationship to one another have both the station of unity and the station of distinction. In this sense, the Manifestations of God all fulfill the same purpose and perform the same function by mediating between God and creation. In this way each Manifestation of God manifested the Word of God and taught the same religion, with modifications for the particular audience's needs and culture. Bahá'u'lláh wrote that since each Manifestation of God has the same divine attributes they can be seen as the spiritual "return" of all the previous Manifestations of God. The Bahá'í belief in the oneness of the Manifestations of God does not mean, however, that the same individual soul is born again at different times and in different physical bodies. In the Bahá'í view, the various Manifestations of God were all different personalities and had separate individual realities. Instead their equality is due to that Manifestation of God manifested and revealed the qualities of God to the same degree. There is no definitive list of Manifestations of God, but Bahá'u'lláh and `Abdu'l-Bahá referred to several personages as Manifestations; they include Adam, Noah, Krishna, Moses, Abraham, Zoroaster, Buddha, Jesus and Muhammad. The Báb, as well as Bahá'u'lláh, were included in this definition. Thus religious history is interpreted as a series of periods or "dispensations", where each Manifestation brings a somewhat broader and more advanced revelation, suited for the time and place in which it was expressed. Bahá'ís do not claim that the Bahá'í revelation is the final stage in God's direction in the course of human spiritual evolution. The Bahá'í writings contain assurances that after 1000 years, another Manifestation of God will appear to advance human civilization. One of the fundamental principles of the Bahá'í Faith is that religious truth is not absolute but relative. The teachings of the different world religions are seen as 'facets of one truth'. Bahá'í texts include statements of a dualist nature (e.g. in the Book of Certitude) and statements of a monist nature (e.g. in the Seven Valleys and the Hidden Words). Moojan Momen, in his translation of 'Abdu'l-Bahá's commentary on the tradition "I was a Hidden Treasure", states that the differences between dualist and monist views are reconciled by the teaching that these opposing viewpoints are caused by differences in the observers themselves, not in that what is observed. This is not a 'higher truth/lower truth' position. God is unknowable. For man it is impossible to get any knowledge of God or the Absolute, because any knowledge that one has, is relative. Theological differences about God are caused by imagination, as God's essence can not be described. Less stress is given to metaphysical subjects, while ethics and social action are emphasized. Ian Kluge holds a different view than Momen, which he calls 'relationalism' (associated with the process philosophy as described by A.N. Whitehead and his successors). Kluge states that the Bahá'í teachings do not accept an ontological monism and that not all views can be correct. Keven Brown concludes that the "realities of things are manifestations of the first thing to emanate from God, the Primal Will", but they are "not manifestations of the unknowable and inaccessible Godhead", and that according to the Bahá'í teachings the "true meaning of union (or knowing) in the mystic quest is not union with (or knowing) the Essence of God (which is impossible to attain), but recognition of the Manifestation of God for the day in which one lives". Nader Saiedi describes the Báb's explanations about the dual stations of the "Point", another term for the Primal Will of God. Roland Faber has discussed the subject from a non-dualist Buddhist perspective. Bahá'ís follow Bahá'u'lláh, a prophet whom they consider a successor to Zoroaster, Abraham, Moses, Jesus, Muhammad, Krishna and Buddha. This acceptance of other religious founders has encouraged some to regard the Bahá'í religion as a syncretic faith. However, Bahá'ís and the Bahá'í writings explicitly reject this view. Bahá'ís consider Bahá'u'lláh's revelation an independent, though related, revelation from God. Its relationship to previous dispensations is seen as analogous to the relationship of Christianity to Judaism. They regard beliefs held in common as evidence of truth, progressively revealed by God throughout human history, and culminating in (at present) the Bahá'í revelation. Bahá'ís have their own sacred scripture, interpretations, laws and practices that, for Bahá'ís, supersede those of other faiths. In 2002 the Universal House of Justice wrote a letter to the world's religious leaders, addressing the disease of sectarian hatreds, calling on all religious movements to "rise above fixed conceptions inherited from a distant past." In 2005 the document One Common Faith was published, primarily intended for a Bahá'í audience, in which it identifies as a major challenge for the Bahá'í community the inculcation of the principle of the oneness of religion and the overcoming of religious prejudices. ^ a b Smith, Peter (2000). "metaphysics: relativism". A Concise Encyclopedia of the Bahá'í Faith. Oxford: Oneworld Publications. p. 245. ISBN 1-85168-184-1. ^ a b c Momen, Moojan (1988). Studies in the Bábí and Bahá’í Religions vol. 5, chapter: Relativism: A Basis For Bahá'í Metaphysics. Kalimat Press. pp. 185–217. ISBN 0-933770-72-3. ^ Momen, Moojan (2003). "The God of Bahá'u'lláh". In Momen, Moojan. The Baha'i Faith and the World's Religions. Oxford, UK: George Ronald. pp. 1–38. ^ a b Momen, Moojan (2011). "Cosmogony and Cosmology viii. in the Bahai faith". Encyclopædia Iranica, Vol. VI, Fasc. 3. pp. 328–329. ^ Kluge, Ian (2008). Relativism and the Bahá'í Writings. in Lights of Irfan, Volume 9, pages 179-238. Irfan Colloquia, Wilmette, IL, USA. ^ Brown, Keven (2001). 'Abdu'l-Bahá's Response to the Doctrine of the Unity of Existence. Journal of Bahá'í Studies, 11:3-4. ^ Saiedi, Nader (2008). Gate of the Heart. Waterloo, ON: Wilfrid Laurier University Press. pp. 173–199. ISBN 978-1-55458-035-4. ^ Faber, Roland (2017). Bahá'u'lláh and the Luminous Mind: Bahá'í Gloss on a Buddhist Puzzle, in Lights of Irfan 18. ^ Smith, Peter (1999). A Concise Encyclopedia of the Bahá'í Faith. Oxford, UK: Oneworld Publications. pp. 276–277 & p.291. ISBN 1-85168-184-1. ^ Stockman, Robert (1997). The Baha'i Faith and Syncretism. ^ Universal House of Justice: Letter to the World's Religious Leaders (2002). ^ Universal House of Justice (2005). One Common Faith. Wilmette, Illinois, USA: Bahá'í Publishing Trust. ISBN 0-87743-315-1. Cole, Juan (1982). "The Concept of Manifestation in the Bahá'í Writings". Bahá'í Studies. monograph 9: 1–38. Lundberg, Zaid (May 1996). Baha'i Apocalypticism: The Concept of Progressive Revelation. Department of History of Religion at the Faculty of Theology, Lund University. `Abdu'l-Bahá (1908) . Some Answered Questions. Wilmette, Illinois, USA: Bahá'í Publishing Trust. ISBN 0-87743-190-6. Bahá'u'lláh (1862). Kitáb-i-Íqán: The Book of Certitude. Wilmette, Illinois, USA: Bahá'í Publishing Trust. ISBN 1-931847-08-8. Bahá'u'lláh (2006). The Tabernacle of Unity, Bahá’u’lláh’s Responses to Mánikchí Sáhib and Other Writings. Haifa, Israel: Bahá’í World Centre. ISBN 0-85398-969-9. Buck, Christopher (1999). 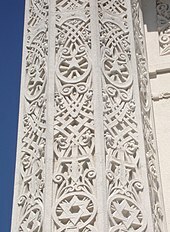 Paradise and Paradigm: Key Symbols in Persian Christianity and the Baháí̕ Faith. SUNY Press. ISBN 9780791497944. Momen, Moojan (1995). Baha'u'llah's prophetology: Archetypal patterns in the lives of the founders of the world religions. Bahá'í Studies Review, 5.1. Momen, Moojan (1994). Buddhism and the Bahá'í Faith. Oxford, UK: George Ronald. ISBN 0-85398-384-4. (short version of this title here). Rost, H.T.D (1986). The Golden Rule - A Universal Ethic. Oxford, UK: George Ronald. ISBN 978-0-85398-227-2. Ruhi Institute. The Power of the Holy Spirit. Sours, Michael (2000). Without Syllable or Sound: The World's Sacred Scriptures in the Bahá'í Faith. Los Angeles, United States: Kalimat Press. ISBN 1-890688-06-1. Bahai.org God and His Creation. Bahai.us. The Bahá'í Faith and Christianity. Bahá'í Library. Compilation: Cultural Diversity in the Age of Maturity.